Last Monday, I posted today’s male paper doll set in black and white. Today, Mikhail is up in color with his world ending fashion statements. I mean, you want to look good at the end of the world, don’t you? Post-apocalyptic fashion is something that fascinates me. I collect photos and idea on Pinterest even if I’m not prepping for a set, because then when I do want something I can go looking for it. So, I have a whole board devoted to Post-Apocalyptic clothing. This is something I encourage everyone to do. After Wenesday’s post about Paper Doll Principles, I noticed a lot of people asked how I came up with ideas. There is not such thing as a totally unique idea. Inspiration comes from having easy and ready access to the things that you like. By having a collection of other’s Post-apoolcyptic fashon ideas at my fingertips, it was easy for me to develop my own. So, I urge you if you are struggling. Collect images and ideas that intrique you. 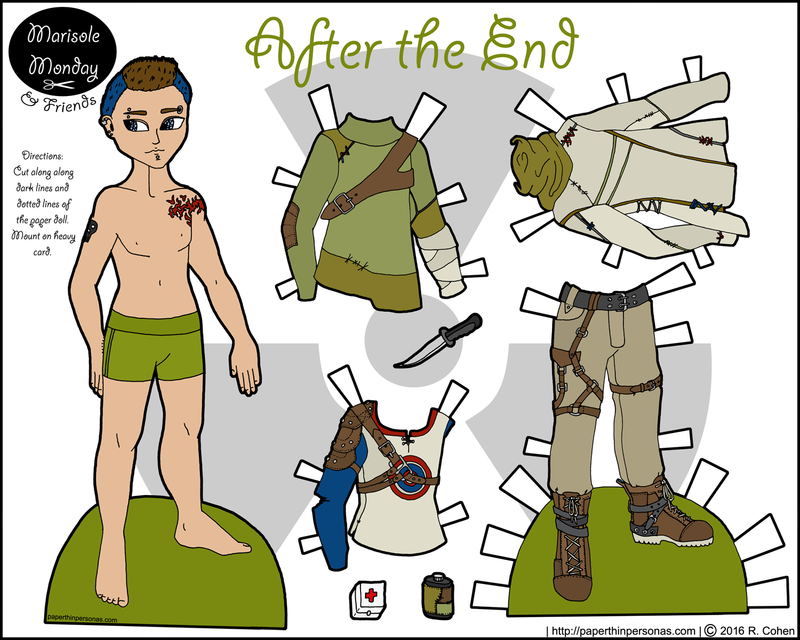 If I ever draw another post-apocalyptic paper doll, I’ve got 188 images to help me come up with ideas. To continue our discussion on inspiration, here’s a shirt that inspired me, a leather harness, this shirt and these boots. All those pieces inspired this set of paper doll clothing and I am sure if I looked I could find more images that I found that inspired me. I can tell you that the red and blue shirt was sorta a riff on the Captain American shield and came about, because I got sick of coloring things green and tan. I’m still not totally pleased with his hair. I think there’s something off about the angle. Anyway, as always, let me know what you think in the comments and if you want to support the blog, please consider becoming a patron. Pinterest is such an amazing resource. I use it everyday for all of my creative projects so I totally agree with you. Am I the only one who thinks Mikhail and the B&B World’s End doll from February make a perfect pair? Because they totally do. They’re not in scale with each other, but they could totally be from the same world. Seriously though, I am treating beards and mustaches and whatever else I decide to draw like I do the hair on all the other paper dolls. So, sometimes there will be facial hair and sometimes there won’t be. I am really loving the Marcus 2.0 series and this page might be my favorite so far. I can’t wait to see where you go next with them!